With just a few small changes you can more than double the number of survey responses so its’ worth sweating the details. Before you start the survey process make sure that you have good contact information for your customers. If 30% of your customer email addresses are wrong then you have no chance of them responding. That will be the first dent in your response rate. Surprising as it may seem, even business to business companies with high value contracts worth hundreds of thousands of dollar per year often have out of date or incorrect contact information on their key customers. These days people change employers more often than they did in the past so their contact information changes as well. If you are in a consumer business your email list can go bad (incorrect) at a rate of up to 30% per annum. Take some time to clean up your data before you start the survey process. Not only will it improve your response rate but your sales team will thank you as well. Alerting your customers to expect a survey will make them more disposed to respond and increase response rates. In Business to Consumer situations, coach staff to alert customers to look out for the survey. Make sure, however, that they do not use this as an opportunity for customer survey score begging. For Business to Business customers, send a pre-notification from someone the customer will recognize, a CEO, country manager, or business leader. Let them know the invitation is coming and what your process is for taking action. The simple rule of “what’s in it for me” applies so make sure you are clear what is in it for the customer. There can be good reasons to deliver your survey via telephone or face to face but many customer surveys will be web based with an email invite. In these cases you can use the extensive experience of email marketers to maximise your open and click through rates, which will in help maximise survey completions. The subject line and “from” name for your email are very important in driving open and click rates. Don’t use “Quality Department” or an unfamiliar name. Even if the CEO’s name is familiar to you, it might not be to your client. You can also use something like: “John Smith (Acme Inc.)” to make the link to both the company and person. Subject lines are just as important because people use them for spam identification and deletion. There are lots best practices we can take from the marketing industry on customer survey invite subject lines that work. Each of these is unambiguous as to what the email is about and promises a short task. Give a realistic estimate of the time it will take, don’t fudge this. Thank the customer in advance for their response. Show the survey link, see more below on this. In your, now simplified, email make sure the only call to action is the survey link. I know, I know, Marketing want you to put in a link to the Twitter and Pinterest accounts and the webinar they’ve been promoting, but resist at all costs. The more calls to action (links) in the email, the more cluttered it is and the less likely the respondent is to click on the one link you really care about: the survey link. The use of the first person “my” in this context is important as it has a higher click through rate than the third person “your”. If you must use an image link then make sure that you also include a simple text version as well to cover for when images are turned off, see below. If you want people to respond to your survey then they need to be able to read the email invite. According to Experian, 48% of total email opens occurred on a mobile phone or tablet in Q2 2014. So having your survey and invite look good on mobile devices is not an option, it’s half your respondents. Your email message must be easy to read and click on a mobile device. Your survey must be easy to complete on a mobile device. If you use an HTML template for your email invite you need to be particularly careful to ensure that it renders properly on a mobile device. You can certainly use fancy email templates but you might also consider a text based email. Testing has revealed that text based emails have higher click through rates (almost double) than HTML templates. Plus, text based emails are easier to build and can be relied upon to render properly on a mobile device so they win all round. You might like to keep the HTML formatting codes so you can create nice looking survey links but make it look like a text email. If you must send your survey invite as an HTML document, limit or eliminate images from the email. More research indicates that 43% of email clients block images. So if you use images for key parts of your message it will depress response rates. Here for example is what happens if you get it wrong. In this Club Med invite (yes big companies get it wrong too) they used images for all of the most important parts of the invite including the key call to action, aka, the survey link. From what I see below there is no way to get started on the survey, if you don’t have the images showing. With images download turned on the message looks great but for many a quick “delete finger” that will be too late. If your carefully crafted invite ends up in the spam folder the chance of getting a response to your customer satisfaction survey is, shall we say, limited. Unfortunately there are no easy rules to ensure our important invite is not tagged as spam. The spam filtering services are very cagey on telling us exactly what not to do so they don’t give the game away to the spammers. Research does indicate that past recommendations on what puts you into the spam folder are no longer as important. For instance, putting “free” in your subject line will not automatically get your invite put into the spam folder. Using a known email address or domain that the customer may already have whitelisted. Generally if you have a relationship with them on email it will also mean that you have a better chance to be whitelisted. Simple emails with lower image rates also seem to get through more often; even more reason to use the text invite noted above. In our experience a simple reminder sent to people who have not responded after a few days, results in an average 50% lift in survey completions. So if your rate is 10%, a reminder will lift it to 15%. Note that you should not use the word “reminder” in the subject line as that will decrease the open rate of your email. Getting feedback from your customers is good, so getting more must be better. Right? Maybe. Make sure that you don’t over ask your customers for feedback as your completion rates will drop off quickly. We use GoToMeeting for our webinars and many customer meetings. After every, yes every, session they ask for feedback on the service. The first few times I provided feedback but then stopped and have not done their survey for a long time. Contrast that with the Skype approach where they seem to have a random process and I am asked only every so often. It works as I continue to convert and provide feedback for them on a regular basis. The big question is how often is too often and unfortunately there is no one rule. If a customer uses your service often (every day) them perhaps you can survey them once a month. On the other hand if they only interact with you once a year then an annual survey is probably the highest frequency that will be appropriate. Now that you have the survey invite in your customer’s inbox and they have clicked through — make sure they complete it. Not only do respondents need to be able to read the invite on a mobile device, they also need to be able to complete the survey on a mobile device. Make sure that your survey software provider is able to deliver the survey in a mobile enabled format. This is not a nice to have option but a deal breaker. If they can’t provide a survey that works on mobile devices, change vendors. I am often asked whether you should use an incentive such as a competition or free movie tickets to encourage customers to complete the survey. The general answer is no – if you survey is designed well you will not need an incentive to convince customers to respond. There is also a danger that if you use an incentive you will just collect bad quality data from the people that just want the incentive. If the rest of your process is well designed you will not need an incentive. Good customer feedback surveys are short customer feedback surveys. Every question you add will drive down your response rate. It is entirely possible to build a very useful and valid customer satisfaction survey with just three questions. If you find yourself going over 10 questions stop and review what you’re asking. The odds are that the survey has transformed into a fishing expedition where you sling all manner of questions at the customer hoping to find something useful. Not only is this inconsiderate of your customer’s time, it also adds questions to the survey. More questions mean a lower response rate. Try to never ask customers questions to which you already have the answer. Use the survey software to match up the responses with the customer information you already have. 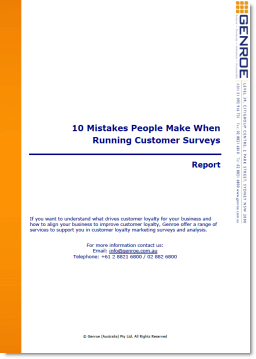 Your survey needs to be more than just short. It also needs to have the right sort of questions, so it’s easy for customers to complete. Some question types are easy to answer and some are difficult. Too many difficult questions and your customers will give up. This is an easy question for a customer to answer, and one that can provide good insights to the business. On a scale of 1 (unresponsive) to 7 (very responsive) how responsive is our service team. On the other hand open questions like this are harder for customers to answer and need to be used very sparingly. What do you think of the responsiveness of our service team? You see, the same topic but very different impact for customers, and for the analysis of your data. Another common and particularly mentally intense form of question is the prioritize question. Try to eliminate these questions in your survey as they are not only difficult for customers to answer accurately, they are also difficult to analyse. Customers will be happy to answer your questions if they are relevant to their experience with your company and not marketing or sales related. A professional service customer feedback survey should include service attributes such as trust, attention to detail, reliability, etc. These are attributes that your customers would reasonably expect that you might ask so they are relevant and understandable. “What is your budget for [professional services] next quarter”. These questions are not related the service delivery and dramatically cut the trust of respondents, reducing their response rate at the same time. To increase survey response rate ensure that your questions are easy for the respondent to understand. Don’t use complex sentence construction such as double negatives or multiple parts. If your questions are complex to understand you also run the risk that respondent will be confused when they answer and do so incorrectly, e.g. answering “yes” when the sentence construction indicates they really mean “no”. You may think that the survey completion rate task is just optimising how the survey is presented to your customer but just as important is the feedback that the customer receives from you. If you do nothing with the data and customers see no impact from the feedback they provide, the survey conversion rate will drop over time. Customers quite rightly reason that: if you’re not using the information I’m providing why am I bothering? As an example of how important this is I’ll relate the story of a series of high value business to business customer surveys that I ran for one of our clients. The respondents were senior people in customer organisations giving up 30-40 minutes of their time for a detailed annual face to face interview. One interviewee told me that they were happy to give up their time each year for the interview because they could see our client was actively doing something with the information and their service levels were improving. Wouldn’t you like to have your customers eager to do your survey? It’s not difficult to obtain a good response rate for your surveys but every minor error can have a major impact on the outcome. Don’t send a reminder and the rate drops by 33%. Use images for the survey link and the rate drops another 43%. Use an unknown “from” in the invite and there goes another 43%. Correcting just those three mistakes can lift response rates by 500%. So take a quick audit of your survey process right now and see how much you can lift the response rate in the next 10 minutes.